First, today is the official launch of the BIG 140 Difference Contest, which is easy to enter via the #WorldsShortestGrant. I gave you a heads up in this post, but the basic guidelines are to share your bright ideas for environmental sustainability, plant-based eating, animal welfare or food allergies on Twitter (140 characters or less – get it?) for the chance to win funding for your idea. So Delicious will be giving away a total of $100,000, ranging from $140 to $10,000 per winner! The event got me thinking about incorporating more plant-based meals into our daily diets, and the first thing that came to mind was a boisterous quinoa bowl (since quinoa is a good plant-based source of natural protein). But to keep with the idea of environmental sustainability, I wanted to make this quinoa bowl with seasonal produce that is accessible in most grocers. Queue the asparagus and organic carrots! I also added mushrooms, which are a pretty good option year round, but morels are a special spring delight if easy to locate and within your budget. 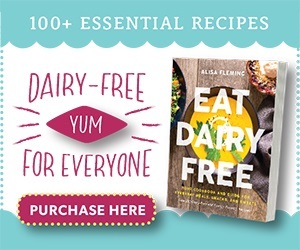 The second inspiration was my #365dairyfree pledge – to trial 365 new-to-me dairy-free recipes this year. While I could easily whip up an old stand-by dairy-free cream or Asian-inspired sauce, I wanted to push outside of my usual repertoire and try something that was not only a little different, but a perfect fit for this seasonal quinoa bowl. 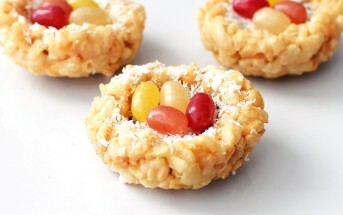 Which brings me to the third inspiration: the new So Delicious Thrive Blog! Leading up to the 140 Difference Contest, I’ve been oohing and ahhing over their gorgeous new blog, which shares the popular brand’s events, fun posts, and recipes. Most recently, I was enticed by a recipe for Vegan Benedict over Spiced Sweet Polenta. It’s topped with an intriguing healthy hollandaise sauce that is not only egg-free and vegan, but also completely oil-free! Consequently, it’s relatively low in fat and extremely versatile. 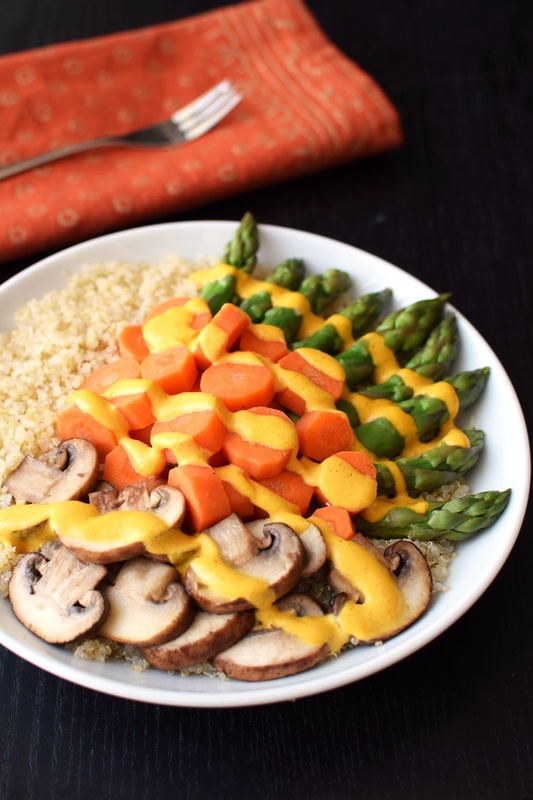 Even if I’m only making one spring quinoa bowl, I make a full batch of the healthy hollandaise sauce in the recipe below and store the leftovers in a squeeze bottle. And I usually use more than one serving of it – in the name of nutrition, of course. Don’t you just love guilt-free sauces? 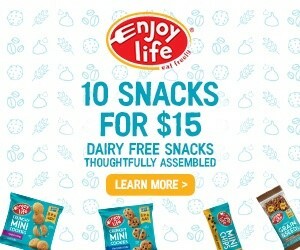 This post is sponsored by So Delicious Dairy Free, but the inspirations are genuine and all of the opinions here are my own. I honestly love the opportunity to share new events, recipes and resources! 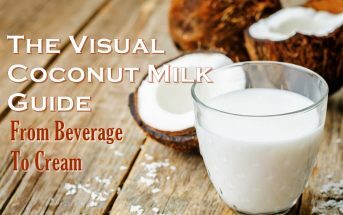 For paleo vegan hollandaise, you can substitute the coconut milk beverage with 2 tablespoons good quality, full-fat coconut milk and 3/8 cup water. To make the whole spring quinoa bowl paleo and grain-free, chop a large head of cauliflower florets and steam until tender. Mince for healthy, steamed bowls of cauli-rice to use in place of the quinoa. The vegan hollandaise in this recipe is adapted from the So Delicious Thrive Blog and their Vegan Benedict Recipe. 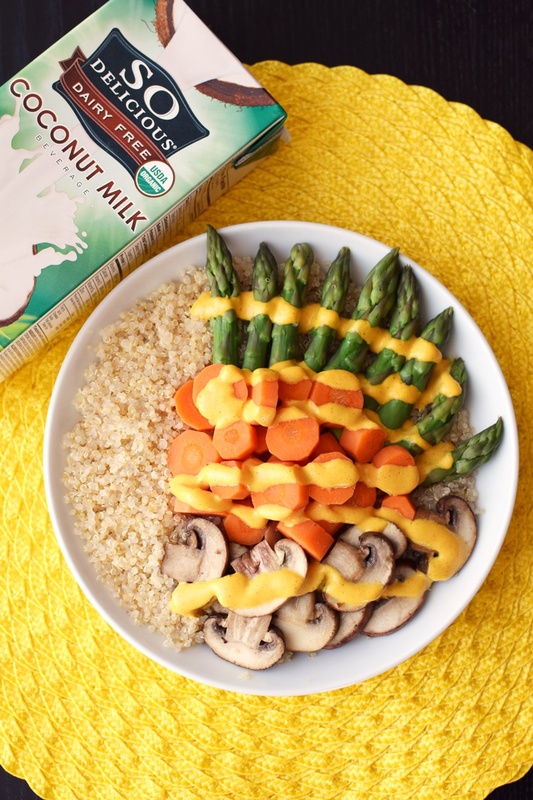 To make the vegan Hollandaise sauce, place the cashews, milk beverage, vinegar, lemon juice, Dijon mustard, turmeric, smoked paprika, and the ⅝ teaspoon salt in your blender, and puree until smooth. Let this sit while you prepare the rest of the meal; it will thicken slightly. Steam the carrot slices and asparagus until tender, about 10 minutes (if the asparagus is thin, it will take just 5 minutes). Meanwhile, heat the olive oil in a large skillet over medium heat. Add the mushrooms, sprinkle with the ¼ teaspoon salt, and saute until just tender, about 3 to 5 minutes. Divide the cooked quinoa between two bowls. Top with the vegetables and drizzle with the vegan hollandaise - I use it all! Optionally sprinkle with fresh ground black pepper or paprika, to taste. My only complaint here is that the dijon ruined the hollandaise, in my opinion. I’m not a big fan of dijon, so it could just be me. I made it again and omitted the dijon and added a teaspoon of terragon and it. was. AMAZING. Also, the mushrooms were a bit bland for me, so I mixed up some spices in there and it worked better. All in all a good recipe. That’s a fabulous swap for the dijon-averse and even those with mustard allergies (a growing concern!) 🙂 Thanks for sharing Kellyn! I could eat quinoa bowls every day – and that hollandaise sounds just perfect! The ultimate spring dish!! 🙂 This sounds sooo much healthier and better than traditional hollandaise sauce! It is! I love making sauces that you can lay on thick. The idea of that sauce is rocking my world. I have to try it, and yes, I am prepared to use it all, as you do! I love the look of this bowl! So healthy and of course really pretty! 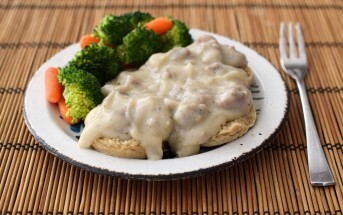 That vegan Hollandaise sauce recipe looks and sounds heavenly!!!! Such a pretty presentation! 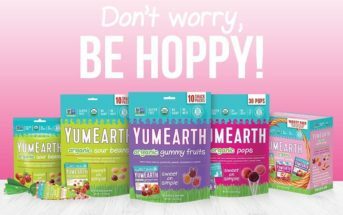 I love So Delicious products. The sauce looks so good. This is so pretty, and so appealing that I think I will be adding my own version to our menu for the coming weeks. I love quinoa, too–it’s so versatile! Thanks for the super inspiration! Hi Dee Dee, I hope you do get the chance to enjoy the recipe – I love hearing how people adapt recipes to fit their own households! That looks so tasty. I loved hollandaise before I became vegan and haven’t eaten it since. I love your version! You must try it Mel! Of course, not spot on to those with eggs, but similar and VERY good! The chefs at So Delicious are genius! What a colorful and healthy plate. Love the hollandaise sauce over it. Will have to check out their other recipes! Thanks Marye, it is good, I promise! This sounds absolutely delicious and your sauce-layering skills are on point! Oh yum never thought of quinoa and “hollandnice” sauce as I call the vegan version 🙂 Great idea Alisa!!! I like that name Amrita – quite clever. I love that you used hollandaise as your sauce! YUM! I love bowls, such great meals! So pretty! I love spring veggies. I’m actually working on a spring quinoa bowl myself, but definitely different than this one. 🙂 Vegan Hollandaise sounds great! Ooh, I can’t wait to see yours Jenn! Your recipes are always so inspiring. Ooh this quinoa bowl looks awesome! And I’ll have to check out that vegan benedict. Thank you Becky! It tastes pretty awesome, too!